Adjustable pulp control lets you get the amount of pulp you want. All parts are dishwasher-safe for fast and easy cleanup! Built-in cord storage keeps the cord neat and out of the way. MSRP $24 Based on the Manufacturer's Suggested Retail Price, this juicer is less expensive than average and is priced in the bottom 3% of juicers. 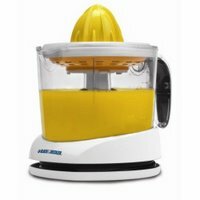 Star Rating 3.4 User reviews, ratings, and feedback indicates that this juicer is rated lower than average by 10 users and ranks in the bottom 20% of juicers.